The twin cities (Minneapolis and St. Paul) are what some of my friends described as a “random place to visit for the weekend.” My New York elitism also did leave me with some doubts on what’s so amazing about this popular Midwest City. I spent three days of my summer in Minneapolis, and I can say that all doubt in my mind is gone. Minneapolis is a beautiful city with a perfect balance of nature and high-rises, everyone is "Minnesota nice," and the vegan scene is very special. 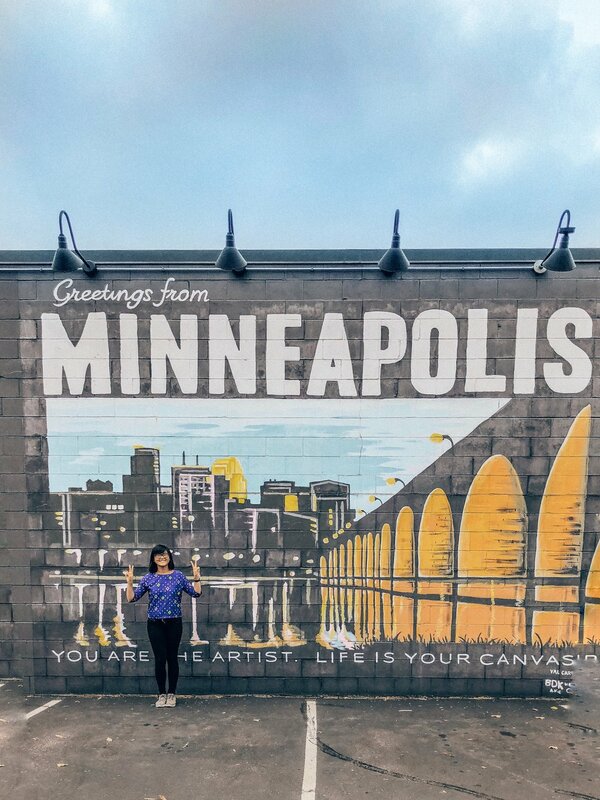 Here’s my guide on what to do in Minneapolis! Herbivorous Butcher is a vegan butcher shop. Yes, you read that right - vegan. butcher. shop. When you step inside, you’re greeted with butcher knife decoration, vegan snacks, and a fridge full of “meat” with butchers ready to pack your plant carcasses. They are infamous for their amazing tasting meats (I bought half a pound of the Korean ribs, bugolgi, pulled pork, shredded chicken, and brats), cheeses (they make their own artisan cheese), burgers/sandwiches (try to catch the Herbivorous Butcher food truck for some awesome burgers), and for challenging traditional butcher shop convention. This place attracts omnivores and vegans because of their special product and idea. This shop alone is a reason to visit Minneapolis! PS: This shop is right next to the famous “I Like You Wall” mural. The drinks are also fun with flavor profiles matching Asian cuisine like the lychee sangria. Across the street from Hai Hai is this vegan crepe and ice cream shop. So once you’re done stuffing your face with sticky rice, you can enjoy one of the best and creamiest ice cream scoops I’ve had as a vegan. I got three scoops: Ube (purple ham), strawberry, and pistachio. I’m already a sucker for ube, but when it was paired with a fresh waffle cone, I knew this place was a winner. I didn’t get to try the crepes, but I heard the savory crepes are drool worthy. I had to hunt down this vegan food truck down in the rain, but I needed to find it to consume their famous lemongrass tofu taco. This taco was worth the hunt because the tofu was so crispy, flavorful, and exactly the complexity of textures and flavors that I like in a taco. Located in St. Paul is a fast food vegan spot that has the addictive taste of Burger King, but much classier. The Dirty Secret is J. Selby’s take on the Double Whopper, and it uses Herbivorous Butcher patties. The burger tasted healthier than Burger King, and was extremely satisfying. I was even more impressed with the Soy Cone, which is their take on a Blizzard. They blend their vanilla soft serve with various other mixtures (I got the berry) to create this sweet and thick ice cream shake. So good. If you’re looking to be a little fancier, Fig + Farro in Uptown is a great vegetable-forward place to clean up and feel great. Everything in the restaurant is focused on sustainability, which includes the fair share of vegan dishes. The menu is seasonal, so I can’t promise you these dishes will be around, but if they are, I highly recommend the Mac and cheese (it may have moved to the kids menu but that doesn’t stop me), the ravioli, and the artichoke dip. This ice cream specializes in both unique vegan and non-vegan flavors. I overheard tons of people being interested in the vegan flavors even though they weren’t vegan just because they sounded delicious. The menu changes regularly, but the flavors I tried were super fun including mango sticky rice and strawberry/guava. There are a few waterfalls within twenty minutes of Minneapolis, and I got to explore Minnehaha Park. You can rent Quad bikes, swim in the river, take a hike (on a paved path) or just spend time in the Minihaha Park while being next to the beautiful rushing waterfall. There are a number of lakes In Minneapolis, and the Airbnb I stayed at was right in front of Bde Maka Ska (previously known as Lake Calhoun), which is right next to the Lake of Isles. It’s a series of beautiful lakes they have paths to run and bike. You can also rent kayaks, sailboats, or swim in the lake! This aesthetic art museum houses contemporary art. What’s cool about this museum is how the exhibits take up a lot of space along the museum walls, marking its identity on the mostly white walls. There are also a number of high vantage point spots in the museum that let you see the city of Minneapolis. They also have mini golf in the summer, which is on their roof. They have 10 courses that are designed by different artists and make for a unique and beautiful challenge. Next to the Walker Art Museum is the free sculpture garden that houses the famous blue chicken sculpture and the cherry on a spoon fountain. There are a number of other sculptures that you can explore while walking through the grass on a beautiful Minnesotan summer day. In my time in Minneapolis, I saw a number of vintage and thrift stores. I can’t say it’s more than in New York, but there are some unique spots to visit like Hunt and Gather. This antique store has two floors of...everything. Anything you can imagine exists in this store (clothes, old paintings, furniture, creepy dolls). If you like antique stores, this will be a fun place for you to explore. Either way, if you pass by a thrift store, step in to explore the old school Midwestern designs. I stayed in an Airbnb facing the Lake in Uptown, which is known as a neighborhood full of young professionals. It’s walking distance to a lot of good brunch spots, bars, and shops, and about 15 minutes or less by car from anywhere you would want to visit in Minneapolis. I also ran around the lake every morning because of how accessible and beautiful it was, so that’s a plus. Uptown is a great neighborhood to be away from the downtown hustle while still being in a great spot in the city. If you are attracted to high rises, staying in Downtown is an incredibly convenient choice, especially if you’re visiting for work, and it gives you close access to the Mississippi River. If you want to be somewhere more hip and posh, I would check out the Warehouse District. If you're in Minneapolis during the yearly 2 week Minnesota State Fair, you have to go! It's the largest state fair in the US by average daily attendance, and it's full of games, rides, attractions, and food! My friend Laura aka 1 Girl, 2 Cities, has a guide to the vegan food at the state fair too!